Who’s Your Farmer? is a widely distributed directory of small farmers and producers within the 5-county Gorge region. It serves as a reference tool for consumers, restaurateurs, and producers, helping them to connect and grow local markets. Click here for our online Who’s Your Farmer? business directory. Farmers and food producers located in the Columbia River Gorge can list their business free of charge by completing this survey. 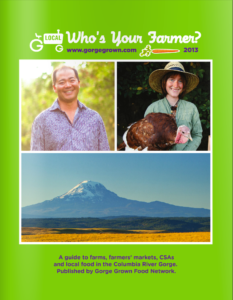 You can access a digital copy of the printed 2013 Who’s Your Farmer? here.